A 120-year-old swimming pool is to be demolished in south-east London despite protests by residents. 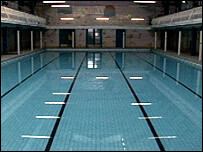 Forest Hill Pool was shut for possible refurbishment in 2006. Lewisham Council has now decided it is beyond repair and will replace it with a leisure centre. Campaigner Max Calo said swimming in the historic pool gave a "sense of awe" you would not get in a modern pool. A council spokesman said: "We found that the cost of refurbishing the pool would have been astronomical." The baths in Dartmouth Road in Forest Hill are housed in a bright red building which has serious structural damage. It was closed by the council in 2006 after it said the building was too dangerous for the public to enter. A series of surveys then found that the damage was more extensive than initially thought, the council spokesman said. It plans to demolish the building and replace it with a £9.5m leisure centre, which will contain a new swimming pool, to open in 2010. But campaigner Mr Calo, who lives nearby, said this would not match the "wonderful experience" of swimming in a historic pool. "You really connect with past generations. It's like going to a museum." Lewisham's mayor, Sir Steve Bullock, said: "If we get the design right, which I think we will, you can have a really interesting mix of new and old which continues to be the civic hub for the Forest Hill area."